This is not all but I had this row out of the Pentel cabinet so I just took some pictures. There are more pencils then there is space for but the collection must go on. There are some nice one here. Thanks Germ. Add all these great Pentels to your collection. Here is a Kickstarter notebook I just got in the mail. A rekonect notebook. Down the spine of the notebook is a magnet and all the pages have some kind of metal strip down one side.This way you can take the pages out. write or draw on them and return them to the notebook. The notebook does take some time to get use to it. The instructions say don't take all the pager out at one time so that was what I did. I see why they tell you not to do that. This notebook is not for everybody because it does require maintenance that some people just to do not want to fool with. I find it fun so I will be using my notebook very soon. Add one to your collection. 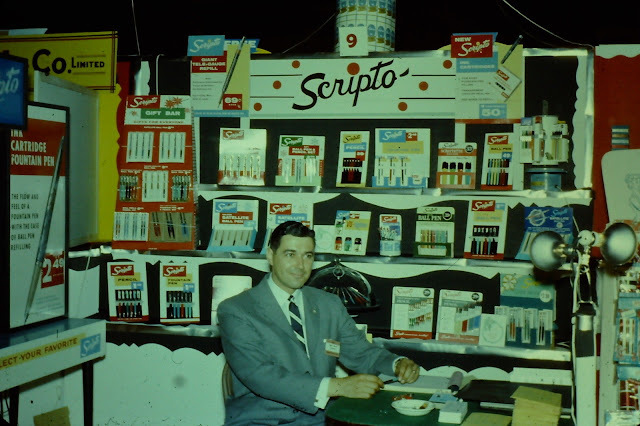 Scripto pen and pencils have always been a big part of the collections. While Scripto may not be big today they were in the past. My collection runs from the 1940s to the 1990s. I have a very large collection of pens and pencil and will be re-posting some of them very soon. This picture was taken at some kind of Trade Show. Add all these great pens, pencils and lighters to your collection. Here we have another Sterling Plastic Pencil Box. My collection is always growing with different pencil boxes and this one is from 1963. This model is a #631 that clips to your binder. The only real problem is that the binder can not be to thick. The box came with two pencils so you would be ready to go. Add these great pencil boxes to your collection. I may have one or two more somewhere in the office. There are also plenty new ones out there that I don't have. I remember when the first Pentel P200s came out in the 70s. I was in Germany at the time and every time they would be on the PX shelve I would buy all they had alone with the R3 rollerball pens. Top row are all P205s except the last two which are P215 and P219. As you can see there are two with the new gold trim, marbled P205 plus the carbon fiber P205. Here we have the P207s and P209s. There is also a P327, PS315, PS 523 and the three PFs for writing on film. Last are my new P205, P207 and P209 from Brazil. Those last three are real hot pink and have the word "Collection" printed on the side. Add all these great pencils to your collection.